Tablescape Thursday..my peonies are blooming! 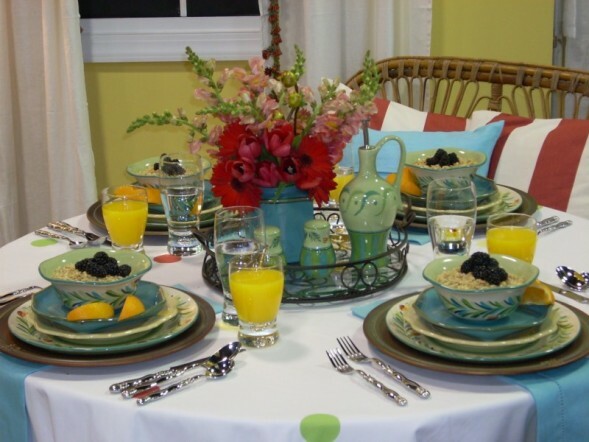 This table setting is great for an afternoon soiree. A light snack of crackers, cookies, and fresh fruit like red and green grapes, blueberries, raspberries and scrumptious strawberries….can you say HEAVENLY? We will have some champagne in these tall fluted glasses to bring out the sweetness of the summer fruit. 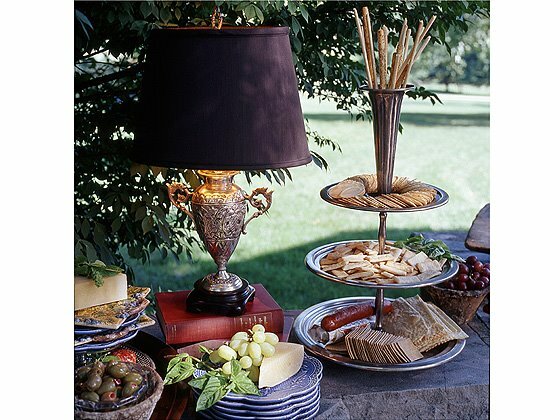 White dinnerware is set atop bronze chargers and sandwiched between red napkins. The final touch is the gorgeous centerpiece filled with blue hydrangeas, peonies, and late blooming lilacs. 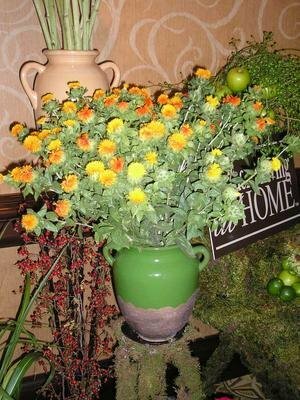 Try a little lamplight on your porch or patio tonite. breadsticks coming out of the top of the pewter tiered server. Lots of textures going on here. Stone, wicker, leather, embossed metal. a FLAT table is a BORING table! 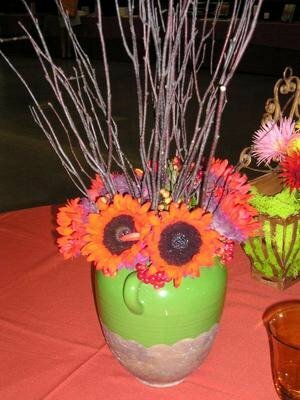 Be sure to have mulitiple levels when designing your tablescapes! That’s all for now…tell me what you think…do you like it? This is a yummy breakfast casserole I had years ago at a baby shower for my dear friend, Angie. I asked her mom for the recipe and I’ve made it several times a year. It is awesome and once you serve it, you will ALWAYS get asked for the recipe! The recipe comes from Kay Nielson…thanks Kay! I usually serve it with granola cereal, yogurt, fresh fruit and orange juice. Oh, and can’t forget my favorite gourmet coffee from Starbucks. I love their coffee beans…..they are full of robust flavor! Layer the above ingredients in a greased 9 x 13 baking pan in the order listed above. Pour this mixture over the bread mixture. Cover & refrigerate overnight. Before baking, melt 1 stick margarine or butter and add 3 cups crushed cornflakes. Spring lunch on the patio..will you join me? 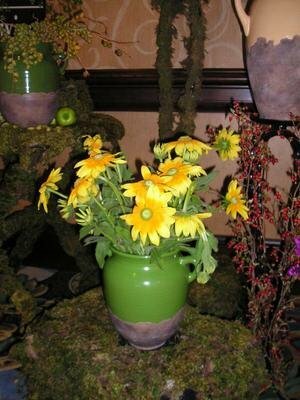 Grab an old milk bottle carrier and fill it with old or new mason jars. 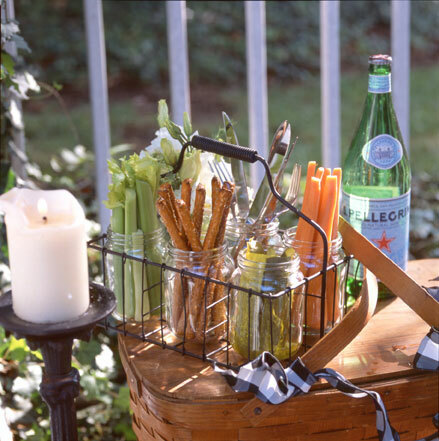 Next add your assorted munchies like carrot sticks, celery, pickles, pretzel rods…don’t forget the silverware. 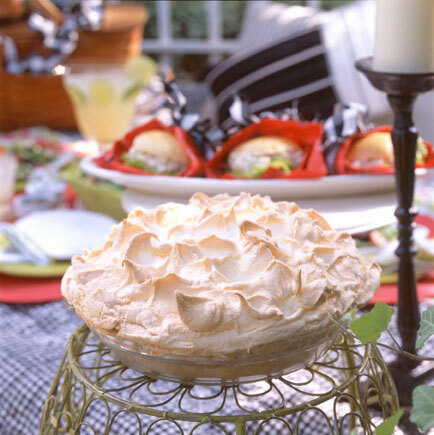 Coconut Creme Pie or Banana Cream Pie is delightful! 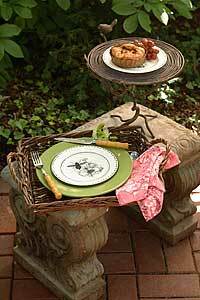 Add height to your outdoor table with an inverted wire basket. A flat table is a BORING table! Don’t forget the candles…yes, I break the rules and light candles during the day! It’s all about the little touches, after all they could be citronella to keep bugs away! Spring greens, fresh strawberries, raspberries, pecans and drizzle with a light salad dressing. Add in some crusty rolls from Panera and you have a yummy and light on the tummy lunch. 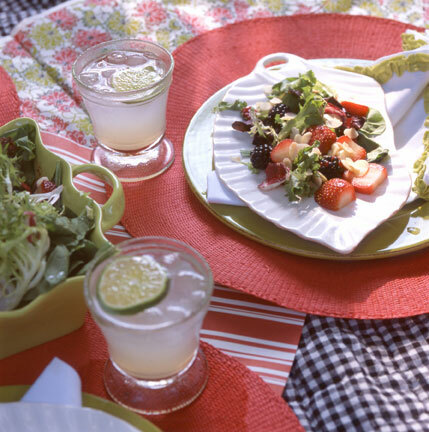 Don’t forget the lemonade with fresh lemon or lime slices! Grab your tray and join me, won’t you?